Insp. Jacques Clouseau teams up with a squad of International detectives who are just as bumbling as he is. Their mission: Stop a globe-trotting thief who specializes in stealing historical artifacts. Matty Banks: I'm, 4-foot 6, I don't shave, I don't have a job, and I'm gonna be an uncle. Is there something weird about that? George Banks: Finally, someone who thinks like I do. Nina Banks: Oh, yeah, a 12 year old. 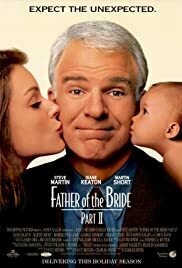 I enjoyed this film, as I did Father of the Bride (1991), though I had to suspend my credulity a lot. This film was less realistic than the film it was based on, Father's Little Dividend (1951), with Spencer Tracy and Elizabeth Taylor. For example, it's unlikely that George Banks, a highly successful business owner who obviously must think through his decisions, would be so impetuous as to sell the house he loves and end up having to buy it back at a significant mark-up. (George and Nina decide to sell following a rainstorm that caused their kitchen ceiling to leak, even though the house had two storeys above it.) The new baby *wing* which the Banks then decide to build on to their repurchased home is equally ridiculous, since the house is already huge and only young son Matty is still at home. 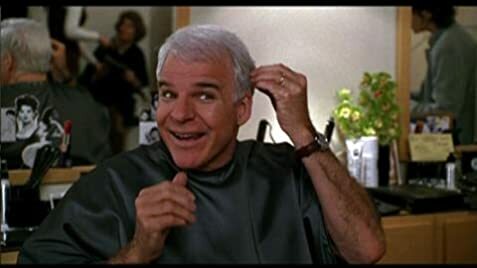 Between the ill-conceived house sale and repurchase, the posh baby wing and the lavish baby shower, featuring storks flown in from Austria, I don't think George Banks could possibly have spent more money. In the previous film, Father of the Bride (1991), Bryan's parents were portrayed as wealthy, but George is clearly a millionaire himself. I did enjoy this movie -- it's funny, romantic and very warm, with beautiful sets -- but I would have preferred a little less over-the-top consumerism.